For those times when you want a more intimate experience, that true third place where good conversation is the only thing you want to be distracted by, the outdoor cafe alley may be a welcome retreat. Unlike the public outdoor cafe walk, the outdoor cafe alley is a more private setting, in a narrow lane that feels more like a hidden discovery. – Pedestrian-only. It’s a quiet place pleasantly filled with the sounds of dialogue. – An organic feel, usually in an alley with older buildings, or at least human-scale architecture and detailing if contemporary. Otherwise it wouldn’t feel intimate. – Often one, not more than two or three local, independent cafes, for the same reasons above. 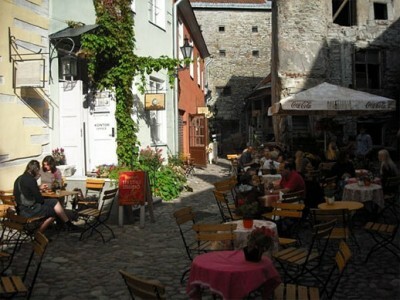 Another option is to have a larger number of alley outdoor cafes on one street by placing them in nooks and setbacks. The modern and highly popular Leopold’s Kafe features a courtyard fronting a newer Georgetown Washington DC alley. Either way, people enjoy feeling like they’re in an outdoor room.